“…we are trying to get the base out…” Newly-released emails confirm politics part of troubled Quinn program. On Tuesday, Oct. 7, former Quinn chief of staff Jack Lavin turned over personal emails subpoenaed by the Legislative Audit Commission that tie the 2010 election and Quinn’s campaign to the Neighborhood Recovery Initiative. Day One of NRI audit hearings highlight mismanagement & lax oversight. In a marathon 12-hour hearing of the Legislative Audit Commission in Chicago Wednesday, the Commission questioned several key players in Governor Quinn’s troubled Neighborhood Recovery Initiative (NRI). The first witness to provide sworn testimony was Barbara Shaw, former director of the Illinois Violence Prevention Authority (IVPA), the agency tasked with the implementation of NRI. Shaw’s testimony before the Commission lasted nearly six hours. While Barbara Shaw is a passionate advocate for anti-violence programs, both the audit findings and the subsequent release of NRI-related emails do not support all of her claims of success and “excellent work” that was done with the NRI program. Issues brought up in the Auditor General’s report, such as hasty implementation, lax oversight and poor record keeping, were largely confirmed as accurate. Shaw was asked who gave her the directive in August 2010 to create NRI. She responded that Malcolm Weems (GOMB) came to her and said the Governor wanted to make a significant investment in violence prevention. Shaw indicated that she took direction in part from the Governor’s Office. NRI was fast-tracked with RFPs due by Oct. 8, 2010. However, it was revealed that 23 lead agencies were emailed on Sept. 14, nearly a month before the RFPs were due. Shaw indicated that IVPA had a list (profile sheets) of lead agencies, that NRI was not a competitive grant program, and that applications were only available to those recommended to apply. It was clear that Shaw was more interested in getting the money out the door fast than making sure it was distributed correctly. The audit manager for Auditor General Bill Holland indicated that to this day, they still don’t know how communities were selected for NRI funding. IVPA didn’t have the list and neither did the Department of Human Services (DHS). Under questioning from Rep. David Reis, Shaw indicated that the Chicago Area Project (CAP) did not raise any red flags with her, as she had no knowledge of CAP having problems administering grants. CAP hired Benton Cook, husband of Cook County Circuit Clerk Dorothy Brown, to be its NRI coordinator for West Garfield Park. Cook steered NRI funds to his own non-profit organization. The next witness to testify was Billy Ocasio, a former senior advisor to Governor Quinn and former 26th Ward Chicago Alderman. Ocasio’s memory seemed to fail him under oath, as he could not recall key details about his involvement in NRI, such as when the first meeting of ministers with Gov. Quinn took place. Ocasio indicated that NRI was an ad hoc committee in the beginning and that he only attended about 10 percent of the meetings. Ocasio’s wife worked as chief of staff at New Life Covenant Church, which was awarded an NRI grant for up to $100,000. Ocasio stated that he had no involvement in that grant and that his wife started working there in January 2012. Warren Ribley, former director of the Department of Commerce and Economic Opportunity (DCEO), was the third former Quinn official to testify before the Commission. Ribley was questioned about $5 million in federal disaster relief funds that ended up as NRI-related microloans just for Chicago. Weems denied saying any such thing. Weems said he was answering a question from an IVPA board member who wanted assurances that funds would be available. He justified his remarks by saying social service agencies were gun shy about participating due to the backlog of unpaid state bills. Late Wednesday, the Quinn administration acknowledged a new grand jury subpoena of emails and other records from a former top Quinn aide. The federal request set a deadline of Nov. 4 (Election Day). Former DCEO Director Warren Ribley’s emails and documents are being sought by federal prosecutors in the latest subpoena that Quinn officials released Wednesday. The request, dated Sept. 26, also seeks emails of Jack Cutrone, the current head of the Illinois Criminal Justice Authority. Day Two of NRI hearings demonstrated an utter lack of accountability. The second day of Legislative Audit Commission hearings regarding Governor Quinn’s troubled Neighborhood Recovery Initiative (NRI) came to a conclusion late Thursday afternoon in Chicago. In Thursday’s hearing, the testimony of several former Quinn administration officials demonstrated an utter lack of accountability for NRI’s implementation and subsequent failure. First to testify was Jack Lavin, Quinn’s former chief of staff, COO, and DCEO director. Emails released to the Commission by Lavin earlier in the week tied the 2010 election to NRI and proved that there were political motivations behind the hasty implementation of the program. Lavin did not indicate who exactly was behind the creation of the NRI program. Lavin claimed that Gov. Quinn created the anti-violence initiative in late July 2010, after meeting with ministers who wanted him to declare a state of emergency in Chicago. Lavin repeatedly stated that it was a team process and that the Governor’s office was a “collegial” atmosphere. However, Lavin, like other witnesses, would not say who specifically bears responsibility for NRI’s problems. When asked about how the communities were selected for NRI, Lavin said crime statistics were used. He didn’t remember seeing documentation containing data for the selection of communities. When asked who picked the aldermen, Lavin said he was not involved in organizing those meetings. He indicated that he did not have a role in selecting the lead agencies and that he had very little contact with Barbara Shaw. In response to Sen. Barickman’s questions about NRI funds going to providers that were not the most qualified, Lavin declined to comment. Lavin testified that he was not aware of significant programs with grant administration and monitoring, stating that “if you’re not aware of the problem, there’s not much you can do.” Lavin did concede that there was enough responsibility for NRI’s failures to go around, but that the ultimate responsibility for the audit findings fell on the Illinois Violence Prevention Authority’s board. Rep. Ron Sandack questioned Lavin on his personal email to Ben Nuckels, Quinn’s campaign manager. Lavin responded that he didn’t have an official role in the campaign and that he was careful not to do any campaign work on state time. Lavin stated that he was helping to educate the campaign on an accomplishment of Gov. Quinn. Rep. Sandack noted that the NRI program hadn’t been launched yet when the email from Lavin to Nuckels was sent. Sandack asked if it was an accomplishment on Sept. 5. Lavin responded that it was about to be an accomplishment. Dr. Toni Irving, former deputy chief of staff for Gov. Quinn, was the second person to testify before the Commission Thursday. Pursuant to its subpoena, the Commission received emails and 25 pages of documents from Dr. Irving late Wednesday evening. Irving’s testimony was brief and did not shed any new light on NRI’s failures. The final person to testify before the Commission was Andrew Ross, former deputy chief of staff for Quinn. Ross displayed a shocking loss of memory when he repeatedly responded to questioning that he did not recall, that it was more than four years ago and that he had no recollection of numerous emails sent to him regarding NRI. Those emails indicated that Ross was involved in an attempt to minimize the political fallout to Quinn from the brewing NRI scandal. As the hearings concluded, Commission co-chairs Barickman and Mautino indicated that the current NRI audit will remain open while the Commission receives additional documents and that the audit of years three and four of NRI will be considered next spring. The Commission is well within its right to keep the audit open, much like the impeachment committee did after former Gov. Blagojevich was impeached and removed from office. There remain two ongoing federal investigations into NRI by the U.S. Attorneys for the Central and Northern Districts of Illinois, as well as an investigation by the Cook County State’s Attorney. The Federal Bureau of Investigation is apparently questioning participants in the NRI program as well. Vaccine research continues; Illinois health director reassures public. Teaching hospitals throughout the United States are testing medications, treatments, and prevention steps against the fast-spreading Ebola virus. Airports at which entrants to the U.S. will be required to undergo additional screening include O’Hare International Airport. Prevention steps include a potential vaccine being synthesized at the University of Illinois Medical Center in Chicago. While federal law requires lengthy testing before a health care substance is approved for U.S. clinical use, compassionate-use and contagious-disease guidelines that apply to diseases spreading epidemically outside the U.S. could make it possible for a new vaccine to be rushed into experimental use for patients in West Africa. Chicago’s NBC-TV/Channel 5 has the story. Meanwhile, the Illinois Department of Public Health is seeking to reassure the public. There is no proof as yet that the dangerous virus can be transmitted through the air in the familiar pathway used by cold and flu viruses. On Monday, October 6, Dr. LaMar Hasbrouck, director of the Department, issued a statement on the epidemic. The director followed up this statement on Wednesday, October 8, with a briefing outline of the Department’s preparedness efforts. Heroin-related deaths double in many U.S. regions. Statistics compiled by the federal Centers for Disease Control (CDC), utilizing death certificates from Illinois, show heroin overdose deaths doubling in a recent 24-month period (2010 to 2012). The rapid rate of growth indicates sharp increases in the supply of illegal heroin in the 28 U.S. states where statistics were tabulated. Police reports indicate that this trend continued, in Illinois, in 2013 and into 2014. The CDC report backs up a push begun by Illinois House Republicans, including Reps. Dennis Reboletti, John Cabello, Patti Bellock and Sandy Pihos, to bring the issue of soaring heroin arrests and overdose deaths to the forefront. The spike in death rates reported this week by the CDC closely follows police reports in many regions of Illinois, including DuPage County. The House Republican heroin package includes HB 5528, a bill demanding that the State improve its tracking and reporting of heroin overdose deaths throughout Illinois. More information on the 2014 House Republican heroin bill package can be found here. The General Assembly is deeply concerned about growing heroin use in Illinois, particularly among young people. The Young Adults Heroin Use Task Force is currently studying ways and means to combat heroin availability among persons in grades 6 through 12. The Task Force was created by HB 946 and its duties expanded by HB 4542. HB 946 became law in 2013 and HB 4542 became law in 2014. Catastrophic-injury issue. An Illinois House hearing on the Illinois High School Association’s management of high school athletics was held in Chicago on Friday, October 3. The hearing centered on the plights of persons who have suffered severe and catastrophic injuries playing high school sports or practicing for teams. The Chicago Tribune covers the story here. State law currently requires local school districts to insure their high school student-athletes with benefit limits of up to $3.0 million or 5 years, whichever occurs first, for the ongoing health-care needs of catastrophically injured students; but some student-athletes (such as witness Kenneth Jennings, injured playing football in 1988) were injured prior to the enactment of this law. Furthermore, in some cases a patient’s lifetime care needs exceed this sum. Because of the challenges facing individual school districts when faced with a mandate of this type, the State law requires the IHSA to establish a group policy in which school districts may insure their students. The IHSA is also required to verify that all students have coverage under the law. Controversial rules before General Assembly committee. Rules from Illinois Department of Natural Resources (DNR) purport to allow the regulated granting of permits for horizontal drilling operations into Illinois shale beds. However, facets of the complex new rulemaking could make it very difficult for the Department to actually issue many permits. House Republicans, by contrast, are pushing to get this potential new, productive industry up and running in compliance with the terms of the law approved by both parties in the General Assembly in May 2013. The DNR rule is currently being scrutinized by the Joint Committee on Administrative Rules (JCAR), which is scheduled to meet in Chicago on Tuesday, October 14. The process, known as “fracking,” has led to geysers of new oil and natural gas production in North Dakota, Texas, and other U.S. states. More than 2 million U.S. oil and gas wells have utilized hydraulic-fracturing technology, leading to new production of more than 4 million barrels of oil per day. The federal Energy Information Administration has the story. However, Illinois does not have a permit structure in place that allows for the legal operation of horizontal-fracturing drill operations into shale beds. Conventional oil production in the Prairie State, estimated at 26,000 barrels per day, currently accounts for less than 0.4% of total U.S crude oil production. Figures are similar for natural gas. Fracking engineers are pushing for a green light that will enable production to begin from what are believed to be substantial reserves of locked-in fossil fuels throughout wide sections of southern Illinois. The DNR rules, promulgated by an arm of the Quinn administration, are seen as delaying this startup and preventing the hiring of skilled workers in affected regions of the state, many of which are currently affected by high rates of unemployment. Hearing scheduled for October 14 in Chicago. The House and Senate agreed earlier this year to create the Joint Criminal Justice Reform Committee. With an eye on nationwide trends in criminal justice and the ever-increasing costs of operating the State’s prison and detention systems, the Joint Committee is authorized to look into ways to amend the State’s Criminal Code of 2012 and other criminal laws. State taxpayers expend more than $1.3 billion a year to operate the prison system. WTTW-TV/Chicago Tonight looks at the issue. The committee will meet on Tuesday, October 14 in Chicago. They are asked to examine the current sentencing structure of Illinois, particularly ways in which disproportionate sentences may be being imposed on certain classes of crime and on groups of criminal defendants. The Joint Committee has been asked to report its findings to the Illinois General Assembly no later than December 1, 2014. House Republican members of the Joint Committee are John Cabello and Dennis Reboletti. New questions raised about Quinn administration project. The proposed Illiana Expressway would connect Indiana’s Interstate 65 with Illinois’ Interstate 55 near Wilmington, Illinois. A high-speed, limited-access highway, expected to be operated by a private-sector partner, would charge a toll for trucks and passenger cars. The interests of the public sector would be overseen by the Illinois Department of Transportation (IDOT), which expects to watch over the Illiana construction project and oversee compliance with the contractual promises made by the private tollway partner. The Quinn administration strongly supports the Illiana Corridor project. In return for making these promises, potential partners are asking to be incentivized by the IDOT. They are signaling their readiness, as a condition of bidding for participation in the project, to demand that the State offer a guaranteed cash flow for the 40-year period that is the expected lifespans of the bonds to be sold to finance the project. Much of this cash flow is expected to come from the tolls that will be charged to motorists, but some of the cash flow may have to come from the State’s hard-pressed Road Fund. As a result of questions being asked about the Illiana Corridor project, including questions about the spreadsheet assumptions used to govern the financial status of the project, a motion was offered on Thursday, October 9 before the Metropolitan Planning Organization (MPO) in Chicago to delete Illiana from the overall Chicago-area transportation plan. Illiana has to continue to be a part of this plan in order for the corridor project to receive many forms of direct and indirect financial help from the U.S. federal government. The motion to delete Illiana from the plan failed by a vote of 10-8-1, signaling that the Illiana Corridor continues to be an official project of Illinois. However, the debate on this Quinn project will continue. Although the overall outlook for the project is unclear, opposition to the road could be building in the Chicago area. Much of the planning work, such as preparation of a preliminary environmental impact statement and selection of a right-of-way, has been done. However, ground has not yet been broken for the Illiana Corridor. The overall status of the project is being monitored by the Illiana Corridor website, a joint venture between IDOT and the Indiana department of transportation. New layoff notices indicate at least 600 jobs to be lost. Reports made by employers to the Illinois Department of Employment Security cover major future layoffs in fall 2014. Pink slips include 138 Professional Transportation railroad-related service jobs in Cahokia, Ill., 123 Anchor Coupling jobs made redundant by the shutdown of a plant in Dixon, Ill.; 91 former Nokia jobs at Microsoft’s Chicago-based mobile phone unit; 82 Pp II LLC plastics-related jobs in Lockport; 63 Olin jobs in East Alton; and 58 service center positions at Jim’s Formal Wear in Ottawa. State law requires businesses with at least 75 full-time employees to provide their workers and the State with at least 60 days’ notice of pending plant closures of mass layoffs. A summary of the Illinois Worker Adjustment and Retraining Notification Act filings, published Tuesday, October 7, can be found here. Metra chief calls for 68% fare hike over ten-year period. Monies from the fare hike will cover a variety of fiscal challenges, including the replacement of much of the system’s rolling stock. 52 locomotives would be bought, and 85 would be rebuilt. 367 new passenger cars would be purchased, and 455 cars would be rehabilitated. Chicagoland’s commuter train infrastructure is said to be nearing the end of its useful life; for example, many of the catenary-powered train cars operated in the South Cook suburbs by Metra Electric were originally brought into service in the 1970s. The fare-hike plan was presented by Metra’s chairman, Martin Oberman, to Metra’s board on Thursday, October 9. Metra’s board approved the hike package by a vote of 10-1. The proposed fare hike would create financial backing to borrow $400 million in debt, which would be an essential element of the overall $2.4 billion financing plan. More than half of the required funds, $1.3 billion, would come from the State of Illinois. Further tax and fee hikes could be required to cover this state aid program. Crain’s Chicago Business has more information on the fare hike request. Preparations for House hearing on October 17 in Chicago. The House and Senate Judiciary Committee will hold a joint subject-matter hearing in Chicago on Friday, October 17 on the subject of body worn cameras for police. A variety of advocates have called for a nationwide, multi-billion-dollar program to have body cameras in use during a growing percentage of the hours spent by police officers in their field work. Different police forces, in different states, are looking at this issue in a variety of ways. WQAD-8/Quad Cities looks at the issue in Illinois and Iowa. In Illinois, current proposals for a body camera program center on the coordination role of the Illinois Law Enforcement Training and Standards Board. Commonly called the “Police Training Board,” the State agency would oversee a grant program that would help local police departments pay for the devices and required training. Key to the proposal is the unanswered question of funding. In recent years police aid-and-training programs have often been funded by imposing an additional supplemental fine on motor vehicle moving violations. In the case of body cameras, skeptics are concerned that this avenue may not raise sufficient funds, on a statewide basis, to pay for the proposed program. Six IDOT aircraft relisted at auction. The Illinois Department of Transportation (IDOT) held a preliminary auction in September to offer surplus State planes for sale. After two Cessnas were sold, IDOT announced plans at month’s end to relist six additional aircraft, with an appraised value of $4 million, for sale. Bids for the planes and helicopter must meet published minimums. The second auction period is scheduled to end on December 15, 2014. Sale of the aircraft is expected to bring in cash flow and reduce the State’s operating expenses. Following the sale, the State’s air fleet will be reduced by almost one-half. Assistant Republican Leader Bill Mitchell of Decatur has repeatedly called for the State to sell its entire fleet of aircraft. The current State air fleet auction status is covered by the Quad City Times here. $375 million renovation begins. The Chicago Cubs, owners of the North Side’s Wrigley Field, have begun a multi-year renovation program intended to rebuild and increase the profitability of the National League’s oldest major league ballpark. Built in 1914 for the now-vanished Federal League, Wrigley Field soon became the Cubs’ home. Operating as an increasing focus for nostalgic baseball fans throughout the U.S., the field long resisted modern innovations such as stadium lights for night games. The 2014-2015 renovation work, which is intended to be completed before baseball Opening Day, will make many changes to the stadium’s appearance and experience. Large billboards and Wrigley Field’s first-ever digital megasign will be erected above the bleachers. The new Wrigley Field installations are expected to sharply limit opportunities for sight-line viewing of the field from Wrigleyville’s famed stadium rooftops on Sheffield and Waveland Avenues. The Ricketts family, owners of Wrigley Field and the Cubs, assert that the renovations will retain much of the ballpark’s historic ambiance and will ensure the club’s future profitability and competitive standing. The Chicago Tribune covered the start of the renovation program here. Get the Week in Review emailed directly to your inbox! Sign up today to get a first-hand look at the continuing legislative and fiscal challenges facing policymakers in Springfield. 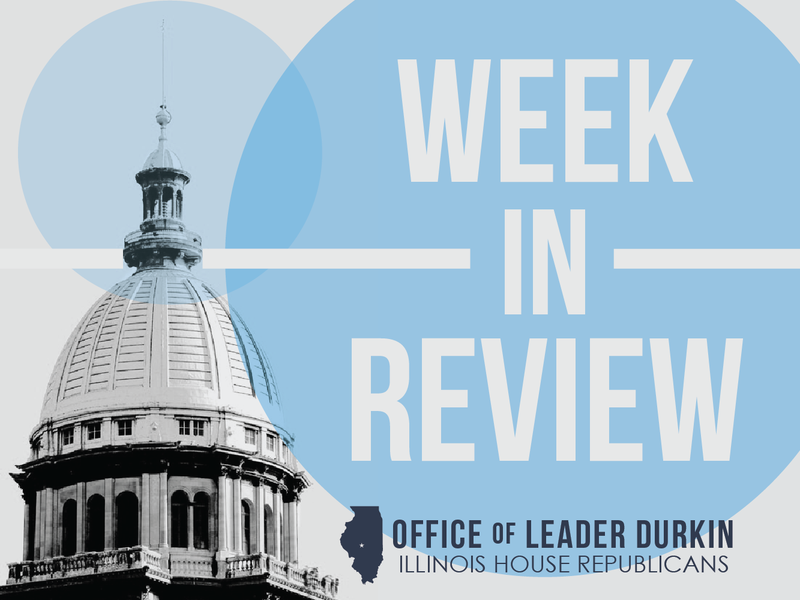 As the General Assembly’s inquiry into the Neighborhood Recovery Initiative (NRI) scandal produces new revelations, the Week in Review is more essential than ever as a way to follow major Illinois issues, questions, and trends.